When emergency service workers arrive at a home and find a person who has suffered a health crisis, the last thing they need is to lose time on finding medical and emergency data. Ideally, all of that information should be stored securely in one place and easy to locate. 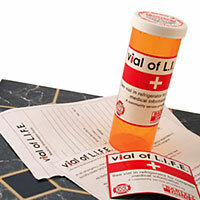 Vial of Life, a program developed in Canada by the Victorian Order of Nurses, and brought to the attention of the TBB Lions by the Point Roberts Fire Services, addresses the issue, helping people to organize vital information and store it in a secure area. The Vial of Life should contain information such as: doctor's name, a provincial health coverage card, list of medications, medical conditions and emergency contacts. A family member or pharmacist should record all the information on a paper form the Lions provide. Often individuals who encounter emergency medical situations must leave their homes in a hurry. There is not always enough time to find necessary medical documents. As the name of the program suggests, documents are kept in clear plastic vials that should be stored in the fridge, because it is an easy location, that all homes would have. People that use the program are also given fridge magnets and door stickers that will alert first responders to the presence of the vial and its vital information. Local pharmacies will, upon request provide patients with 2 copies of their prescriptions, one for the vial and one for backup, in case the first one is taken by medical personnel. Vials can be obtained FREE OF CHARGE at pharmacies, Doctor's offices, Fire Halls and Community Police Stations beginning April 1 in Tsawwassen and in the near future in Ladner. In the future, the Lions hope to have them available in all Senior Care facilities. The Tsawwassen Boundary Bay Lions Club is rolling out a program this month aimed at making it easier for first responders to find vital information when dealing with medical emergencies. The Vial of Life program helps people organize vital information, such as medical conditions, allergies, current medications and emergency contacts, in one place that is easily accessible to emergency responders. The program directs participants to store the forms in the provided plastic vial in the fridge, because it is an easy location and there is one in every home. The kit also comes with a sticker for the front door and a fridge magnet to alert first responders to the presence of the vial. Vial of Life committee chair Roger Lasell said the service club saw the program in use in Point Roberts and decided to bring it to South Delta. The program is sponsored by Eleanor Calderwood with Raymond James and Tsawwassen Pharmacy. Lasell said Vial of Life was rolled out in Tsawwassen starting June 1 with the aim of bringing it to Ladner in the fall. The kits are available free of charge at Tsawwassen pharmacies, fire halls, community police stations and some medical offices. Tsawwassen pharmacies will also, upon request, provide patients with two copies of their prescriptions. For more information, or to request a kit, email vialoflifedelta@gmail.com.